Vancouver, British Columbia and Basseterre, St Kitts and Nevis--(Newsfile Corp. - March 11, 2019) - The Eastern Caribbean Central Bank (ECCB) and the Barbados-based fintech company, Bitt Inc. (Bitt) have signed a contract to conduct a blockchain-issued Central Bank Digital Currency (CBDC) pilot within the Eastern Caribbean Currency Union (ECCU). The watershed contract was signed on 21 February at the ECCB's headquarters in Basseterre, St Kitts and Nevis. This ECCB CBDC pilot is the first of its kind and will involve a securely minted and issued digital version of the EC dollar (DXCD). The digital EC dollar will be distributed and used by Licensed Financial Institutions and Non-Bank Financial Institutions in the ECCU. The DXCD will be used for financial transactions between consumers and merchants, including peer-to-peer transactions, all using smart devices. For example, an individual in St Kitts and Nevis will be able to send DXCD securely from his/her smartphone to a friend in Grenada in seconds - and at no cost to either party. CEO of Bitt Inc., Rawdon Adams, stated: ​"I thank the ECCB for choosing Bitt. Our mission is the practical application of cutting edge technology to solve persistent financial problems. It is about a successful currency union building on its impressive record of financial stability, development and integration to deliver a quantum improvement to the lives of all its 630,000 citizens. Enhancing economic growth and the quality of life of ordinary people is the aim." The Governor of the ECCB, Timothy N. J. Antoine, emphasised that in contrast to previous ​CBDC research and experiments​, ​the ECCB is going a step further. "This is not an academic exercise. Not only will the digital EC Dollar be the world's first digital legal tender currency to be issued by a central bank on blockchain but this pilot is also a live CBDC deployment with a view to an eventual phased public rollout. The pilot is part of the ​ECCB's Strategic Plan 2017-2021​which aims to help reduce cash usage within the ECCU by 50 per cent, promote greater financial sector stability, and expedite the growth and development of our member countries. It would be a game-changer for the way we do business​". The ECCB is now poised to embark on the DXCD pilot from March 2019. The pilot will be executed in two phases: development and testing, for about twelve months, followed by rollout and implementation in pilot countries for about six months. As part of pilot implementation, the ECCB will ramp up its sensitisation and education initiatives to facilitate active public engagement throughout all member countries. The ECCB is being technically supported on this Project by Pinaka Consulting Ltd.
For more information, please view the InvestmentPitch Media "video". If this link is not enabled, please visit www.InvestmentPitch.com and enter "Bitt" in the search box. 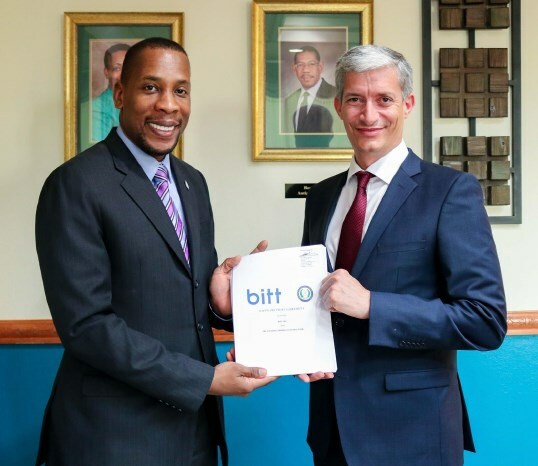 About Bitt Incorporated: ​The Bitt group of companies has positioned itself at the forefront of financial innovation in Barbados and the wider Caribbean. The Company has leveraged blockchain-based distributed ledger technology to produce the most efficient financial services ecosystem to date. About the Eastern Caribbean Central Bank: ​The Eastern Caribbean Central Bank (ECCB) was established in October 1983. The ECCB is the Monetary Authority for: Anguilla, Antigua and Barbuda, Commonwealth of Dominica, Grenada, Montserrat, St Kitts and Nevis, Saint Lucia and St Vincent and the Grenadines​.